The CoffeeShop Blog: CoffeeShop Chalkboard 2: Photo Storyboard! CoffeeShop Chalkboard 2: Photo Storyboard! Today I am posting a new photo template. It is a png file so you can simply drag your images behind the frame and Ctrl-T them to fit. The boys helped me set up a photoshop to photograph the clothespins on the line. Then I added a chalkboard texture and some frames. This photo template/storyboard can be used as a website header, Facebook cover, on cards, or as a display for photos in your blogs/websites. I hope you have fun playing with it! 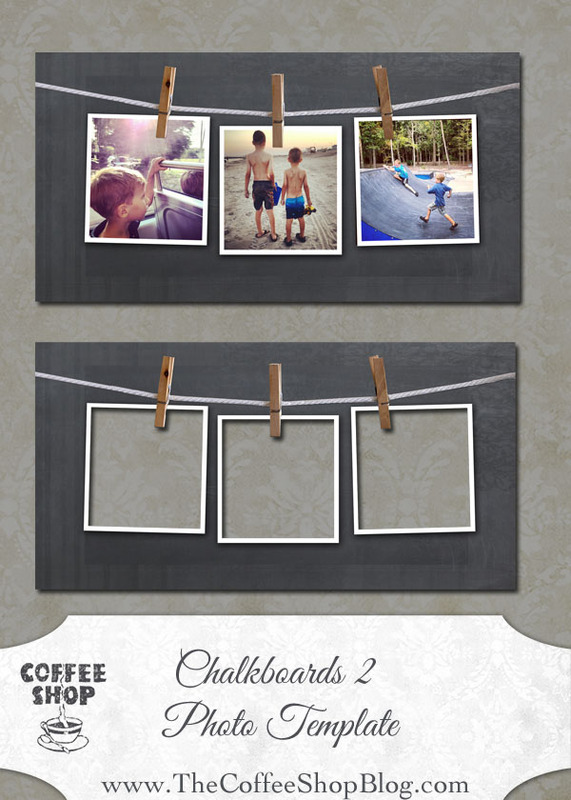 Download the free CoffeeShop Chalkboards 2 Photo Template. You can also download it here. This is not an action. It will open in most photo editing programs. This is great! Thanks so much for all your creativity and sharing with others! These are great! Thanks for sharing so freely with all of us! Love this! Going to try it as part of my blog header I think! Your blog is THE BEST!!!! I'd hope it to be a psd-file, so I could change the background if I liked. But cool anyway, thanks. I will make a version without a background, no problem! And thank you guys!!! This might be my favorite one EVER! Love it! Thank you SO much!! How do I drag a image into photoshop to use use behind this storyboard? What do you mean "drag behind"? When I drag an image, it just goes over the top of the storyboard. When I resize to fit in the square, it still just covers over it, so you can't see the end of the clothes pin. Kathleen if you are using photoshop add a layer and put it under the layer that is the picture. then free transform it to the size of the square. do that for all 3.
hello, I am trying to download coffee shop chalk board 2 story book, and when i clock either link it does not show up, or it opens a new window, but it is blank? Amanda, it is a direct download and I just checked it and it downloaded fine. Just have your downloads set to go to your desktop to make it easy to find the files! Hello, love your blog and it's content. I downloaded the chalk storyboard with the clothes pins and am also having trouble with formatting my images. They cut off the bottom of the clothes pins. Any clearer instructions on this? Thanks in advance!